So, I've been holding out. Can't blame C.I.W. on this one because I've been procrastinating. We broke the Masterpieces case a couple of weeks ago and we put all the cards we got out of it, except for one. That card didn't end on eBay either. Rather it ended in my personal collection because, well, I wanted it. I didn't open the pack through. C.I.W. did and laughed as she handed the card to me. These are the kind of friends we all need. I don't have many (what I refer to as spicey cards) GU or autos. This is just my second Jeter auto, although, my collection is over 700 unique cards. The first was my Christmas present last year from C.I.W. 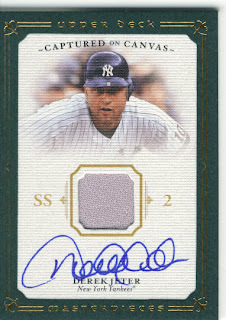 She got me a Jeter auto/game-used jersey numbered to 199 (I think) from Upper Deck Elements. Then, she handed this one to me not too long ago. This adds a lot of spice to my collection. I haven't updated the collection into my log yet, but it's going to happen soon. When I finally do, I am sure that will become it's own blog. I won't say I touched the jersey of either card, but I won't say that didn't either. I am not gonna say I rubbed it all over my face either. But I am not gonna say I didn't. Way to turn Jeter into a whore.